Who knows how many parts it will take to change your automatic car into a stick shift ride. We’ll tell you who, Modern DriveLine, and the people at Select Motors Restoration and Repair in Ball, Louisiana can perform the most professional and seamless Automatic to Standard Shift Conversion. 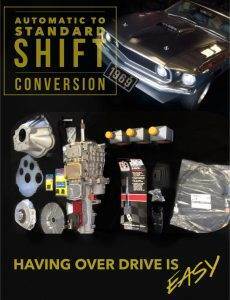 Take a look at this automatic to standard shift conversion package laid out for a 1969 Ford Mustang Mach 1. Even if you don’t have a mainstream vehicle, Select Motors Auto Restoration and Repair can incorporate a standard shift overdrive transmission into your ride. We will do this based on your engine and build as necessary around the swap. Why are you waiting? Call today to get shifting!